In his first start at Georgia, Nick Chubb rushed for 143 yards on 38 carries. In the 2014 Belk Bowl, Chubb broke the bowl game record with 266 rushing yards and was named the Belk Bowl MVP. Chubb finished his freshman season with 1,547 rushing yards, good for second in the SEC, despite starting just eight games. After the Alabama game on October 3, 2015, he tied with Herschel Walker with 13 consecutive 100 yard games. 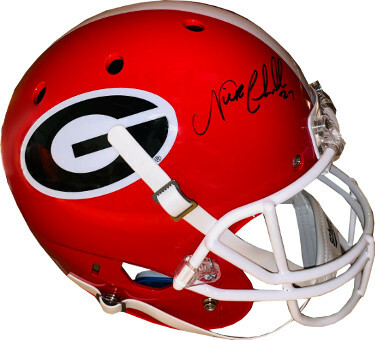 Nick Chubb has hand signed this Georgia Bulldogs Schutt Full Size Rep Helmet #27. Photo of the Signing, JSA Witnessed Hologram and Certificate of Authenticity.